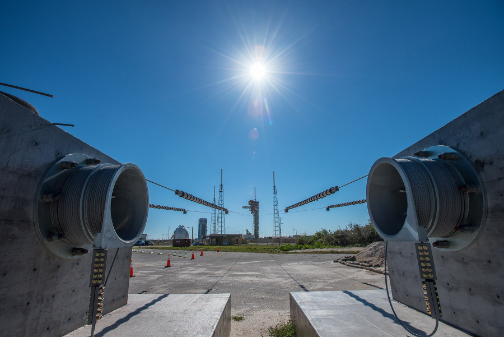 The final test of the Emergency Egress System (EES) was conducted recently, signifying the completion of another United Launch Alliance (ULA) milestone supporting NASA’s Commercial Crew Program. The EES was developed in support of Boeing’s Starliner crew capsule and is a means of rapid egress for astronauts in case of an anomaly. The egress cables are situated on level 12 of the Crew Access Tower (CAT), 172 feet above the Space Launch Complex 41 pad deck at Cape Canaveral Air Force Station and will allow the crew to evacuate the CAT quickly to a landing zone more than 1,340 feet from the launch vehicle. The EES can accommodate up to 20 personnel, including ground crew and flight crew.